Download "191 Ella Grasso Turnpike Windsor Locks, CT 06096 (800) 544-4728 (860) 627-4200 Fax: (860) 627-4224www.360fcu.org"
1 191 Ella Grasso Turnpike Windsor Locks, CT (800) (860) Fax: (860) www.360fcu.org VISA CREDIT CARD AGREEMENT In this Agreement the words you and your mean each and all of those who agree to be bound by this Agreement; Card means the VISA credit card and any duplicates, renewals, or substitutions the Credit Union issues to you; Account means your VISA credit card line of credit account with the Credit Union, and Credit Union and we means the Credit Union whose name appears on this Agreement or anyone to whom the Credit Union transfers this Agreement. This Agreement becomes effective once you are approved for an account. You agree to its terms by using your account. 1. Using Your Account. If you are approved for an Account, the Credit Union will establish a line of credit for you and notify you of your credit limit. You agree that your credit limit is the maximum amount (purchases, cash advances, finance charges, plus other charges ) that you will have outstanding on your Account at any time. If you are over your credit limit, you must pay the amount you are over before payments will begin to restore your credit limit. You may request an increase in your credit limit only by a method acceptable to the Credit Union. The Credit Union has the right to reduce your credit limit, refuse to make an advance and/or terminate your Account at any time for any reason not prohibited by law. 2. Using Your Card. You may use your Card to make purchases from merchants and others who accept VISA Cards. However, you may not use your Card to initiate any type of electronic gambling transaction through the Internet. In addition, you may obtain cash advances from the Credit Union and from other financial institutions that accept VISA Cards, and from some automated teller machines (ATMs). (Not all ATMs accept VISA Cards.) To obtain cash advances from an ATM, you must use the Personal Identification Number (PIN) that is issued to you for use with your Card. You agree that you will not use your Card for any transaction that is illegal under applicable federal, state or local law. 3. Responsibility. You agree to pay all charges (purchases and cash advances) to your Account that are made by you or anyone whom you authorize to use your Account. You also agree to pay all finance charges and other charges added to your Account under the terms of this Agreement or another agreement you made with the Credit Union. If this is a joint Account, Section 17 below also applies to your Account. 4. Finance Charges. New purchases posted to your account during a billing cycle will not incur a finance charge for that billing cycle if you had a zero or credit balance at the beginning of that billing cycle or you paid the entire New Balance on the previous cycle s billing statement by the Payment Due Date of that statement; otherwise a finance charge will accrue from the date a purchase is posted to your account. To avoid any additional finance charges on the balance of purchases, you must pay the entire New Balance on the billing statement by the Payment Due Date of that statement, unless there was also cash advance transaction (which includes balance transfers and convenience check transactions) within the same statement cycle, in which case the grace period ends. Finance charges begin to accrue on cash advances from the date you get the cash advance, there is no grace period. Finance charges will also begin to accrue immediately on all balances including purchases when a cash advance transaction (including balance transfers and convenience check transactions) is performed during the statement cycle. 2 a. All VISA Credit Card Accounts as of December 1, 2009 have variable interest rates. The Annual Percentage Rate or APR, which is a variable rate will be effective and changed semi-annually on the 1st of November and the 1st of May and is determined by adding the margin assigned to your account to the Index. The Index is the Prime Rate as published in the Wall Street Journal on the first business day of the calendar month immediately preceding the change date as previously described. For example, the index rate published on the first business day of October plus the margin assigned to your Account will determine the ANNUAL PERCENTAGE RATE or APR that will apply during the billing cycles that begin in November and continue until the next semi annual change. The index published on the first business day of April plus the margin assigned to your Account will determine the ANNUAL PERCENTAGE RATE or APR that will apply during the billing cycles that begin in May and will continue until the next semi annual change. Before you become obligated the Credit Union will disclose to you whether your Account is Classic or Platinum, the margin that is assigned to your account, along with the current variable ANNUAL PERCENTAGE RATE or APR and corresponding Monthly Periodic Rate. The margin assigned to your Account will be 9% for Platinum cards and 10% for Classic cards. The floor limit on the APR will be equal to the margin for each type of card, in other words the APR on the Platinum card can never be lower than 9% and can never be lower than 10% for the Classic card. In no event will the ANNUAL PERCENTAGE RATE applicable to your Account exceed 18%. The finance charge is calculated separately for purchases and cash advances. For purchases, the finance charge is computed by applying the monthly periodic rate to the average daily balance of purchases. To get the average daily balance of purchases, we take the beginning outstanding balance of purchases each day, add any new purchases, and subtract any payments and/or credits. This gives us the daily balance of purchases. Then, we add all the daily balances of purchases for the billing cycle together and divide the total by the number of days in the billing cycle. This gives us the average daily balance of purchases. For cash advances, the finance charge is computed by applying the monthly periodic rate to the average daily balance of cash advances. To get the average daily balance of cash advances, we take the beginning outstanding balance of cash advances each day, add in any new cash advances, and subtract any payments and/or credits that we apply to the cash advance balance. This gives us the daily balance of cash advances. Then, we add all the daily balances of cash advances for the billing cycle together and divide the total by the number of days in the billing cycle. This gives us the average daily balance of cash advances. The monthly periodic rates and ANNUAL PERCENTAGE RATES will be disclosed on the Visa Credit Card Rate & Fee Disclosure on our Visa application. This Disclosure is available in paper form at any branch or via , or in electronic form at 5. Other Charges. The following other charges (fees) will be added to your Account see the Visa Credit Card Rate & Fee Disclosure, as applicable: a. Over the Credit Limit Fee: You may be charged a fee on a statement date if your New Balance on that date, less any fees imposed during the cycle, is over your credit limit. You may be charged the fee each subsequent month until your New Balance on the statement date, less any fees imposed during the cycle, is below your credit limit but will not exceed two additional consecutive billing cycles for a total of three billing cycle unless another transaction is made which is over the limit. You will only be charged this fee if you have signed up for the Credit Limit Protection program and have given us permission to bring your account over the limit. b. Late Payment Fee: A late charge will be added to your account if you are late in making a payment. c. Returned Payment Fee: If a check, share draft or other form of payment such as ACH or electronic transfer, used to make a payment on your account is returned unpaid, you will be charged a fee for each item returned. d. Transaction Fee for Cash Advance: You may be charged a fee for each cash advance transaction during the statement cycle. e. Card Replacement Fee: You will be charged for each replacement card that is issued to you for any reason. f. Document Copy Fee: You will be charged for each copy of a sales draft (transactions receipts) or statement that you request (except when the request is made in connection with a billing error made by the Credit Union). g. Collection Costs: You agree to pay all costs of collecting the amount you owe under this Agreement, including reasonable attorney fees not in excess of 15% of any judgment and all court cost. h. RUSH Fee: 3 (three) day card order 6. Payments. Each month you must pay at least the minimum payment shown on your statement by the date specified on the statement or no later than twenty-five (25) days from the statement closing date, whichever is later. If your statement says the payment is Now Due, your payment is due no later than twenty-five (25) days from the statement closing date. You may pay more frequently, pay more than the minimum payment or pay the Total New Balance in full. If you make extra or larger payments, you are still required to make at least the minimum payment each month your Account has a balance (other than a credit balance). The minimum payment is 2% of your Total New Balance, or $15.00, whichever is greater, plus the amount of any prior minimum payments that you have not made, and any amount you are over your credit limit. The Credit Union also has the right to demand immediate payment of any amount by which you are over your credit limit. All payments must be made in U.S. currency. 7. Payment Allocation. Subject to applicable law, your payments may be applied to what you owe the Credit Union in any manner the Credit Union chooses. 3 8. Security Interest. To secure your VISA card account, you grant the Credit Union a purchase money security agreement interest under the Uniform Commercial Code in any goods you purchase through the account. If you default, we will have the right to recover any of these goods which have not been paid for. If you give the Credit Union a specific pledge of shares by signing a separate pledge of shares, your pledged shares will secure your Account. You may not withdraw amounts that have been specifically pledged to secure your Account until the Credit Union agrees to release all or part of the pledged amount. In addition, your Account is secured by all other shares you have in any individual or joint account with the Credit Union, except for shares in an Individual Retirement Account or in any other account that would lose special tax treatment under state or federal law if given as security. These other shares may be withdrawn unless you are in default under this agreement. You authorize the Credit Union to apply the balance in your individual or joint share accounts to pay any amounts due on your Account if you should default. Collateral securing other loans you have with the Credit Union now or in the future may also secure this loan, except that a dwelling will never be considered as security for this Account, notwithstanding anything to the contrary in any other agreement. 9. Default. You will be in default if you fail to make any minimum payment or other required payment by the date that it is due. You will be in default if you break any promise you make under this Agreement. You will be in default if you die, file for bankruptcy or become insolvent, that is, unable to pay your obligations when they become due. You will be in default if you make any false or misleading statements in any credit application or credit update. You will also be in default if something happens that the Credit Union believes may substantially reduce your ability to repay what you owe. When you are in default, the Credit Union has the right to demand immediate payment of your full Account balance without giving you notice. If immediate payment is demanded, you agree to continue paying finance charges, at the periodic rate charged before default, until what you owe has been paid, and any shares that were given as security for your Account may be applied towards what you owe. 10. Liability for Unauthorized Use-Lost/Stolen Card Notification. 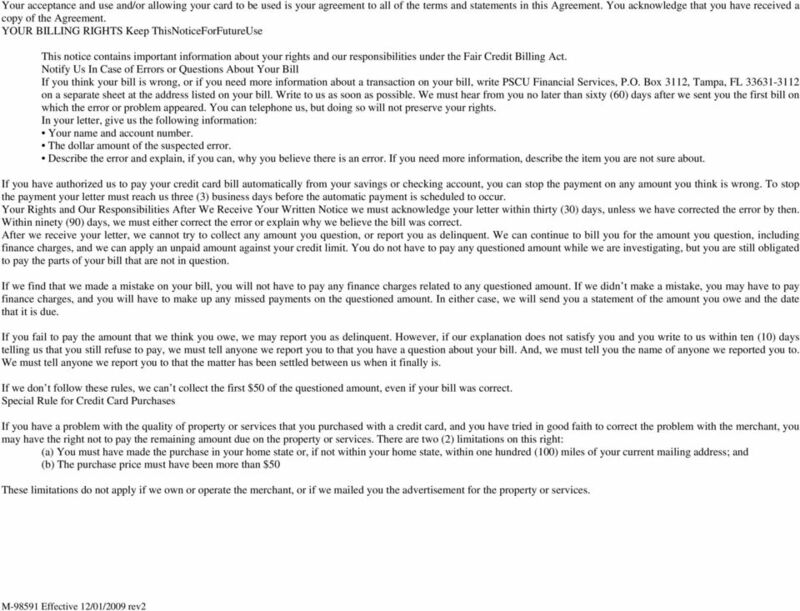 You agree to notify us immediately, orally or in writing to Card Services, P.O. Box 3112, Tampa, FL or telephone (800) twenty-four (24) hours a day, seven (7) days a week, of the loss, theft, or unauthorized use of your Credit Card. You may be liable for the unauthorized use of your Credit Card. You will not be liable for unauthorized use that occurs after you notify us of the loss, theft, or possible unauthorized use. You will have no liability for unauthorized purchases made with your credit card, unless you are grossly negligent in the handling of your card. In any case, your liability will not exceed $ Changing or Terminating Your Account. The Credit Union may change the terms of this Agreement from time to time. Notice of any change will be given in accordance with applicable law. If permitted by law and specified in the notice to you, the change may or may not apply to your existing Account balance as well as to future transactions. Either you or the Credit Union may terminate this Agreement at any time, but termination by you or the Credit Union will not affect your obligation to pay the Account balance plus any finance and other charges you owe under this Agreement. You are also responsible for all transactions made to your Account after termination, unless the transactions were unauthorized. The Card or Cards you receive remain the property of the Credit Union and you must recover and surrender to the Credit Union all Cards upon request or upon termination of this Agreement whether by you or the Credit Union. The Credit Union has the right to require you to pay your full Account balance at any time after your Account is terminated, whether it is terminated by you or the Credit Union. If this is a joint Account, Section 17 of this Agreement also applies to termination of the Account. 12. Credit Review and Release of Information. You authorize the Credit Union to investigate your credit standing when opening or reviewing your Account. You authorize the Credit Union to disclose information regarding your Account to credit bureaus and creditors who inquire about your credit standing. If your account is eligible for emergency cash and/or emergency card replacement services, and you request such services, you agree that we may provide personal information about you and your account that is necessary to provide you with the requested service(s). 13. Returns and Adjustments. Merchants and others who honor your Card may give credit for returns or adjustments, and they will do so by sending the Credit Union a credit slip which will be posted to your Account. If your credits and payments exceed what you owe the Credit Union, the amount will be applied against future purchases and cash advances. If the credit balance amount is $1 or more, it will be refunded upon your written request or automatically after six (6) months. 14. Additional Benefits/Card Enhancements. The Credit Union may from time to time offer additional services to your Account, such as travel accident insurance, at no additional cost to you. You understand that the Credit Union is not obligated to offer such services and may withdraw or change them at any time. 15. Foreign Transactions. Purchases and cash advances made in foreign currencies will be debited from your account in U.S. dollars. The exchange rate between the transaction currency and the billing currency used for processing international transactions is a rate selected by Visa from a range of rates available in wholesale currency markets for the applicable central processing date, which rate may vary from the rate Visa itself receives, or the government-mandated rate in effect for the applicable central processing rate. The exchange rate used on the processing date may differ from the rate that would have been used on the purchase date or cardholder statement posting date. A fee of 1% of the amount of the transaction, calculated in U.S. dollars, will be imposed on all foreign transactions, including purchases, cash advances and credits to your account. A foreign transaction is any transaction that you complete or a merchant completes on your card outside of the U.S., Puerto Rico or the U.S. Virgin Islands. 4 16. Merchant Disputes. The Credit Union is not responsible for the refusal of any merchant or financial institution to honor your Card. 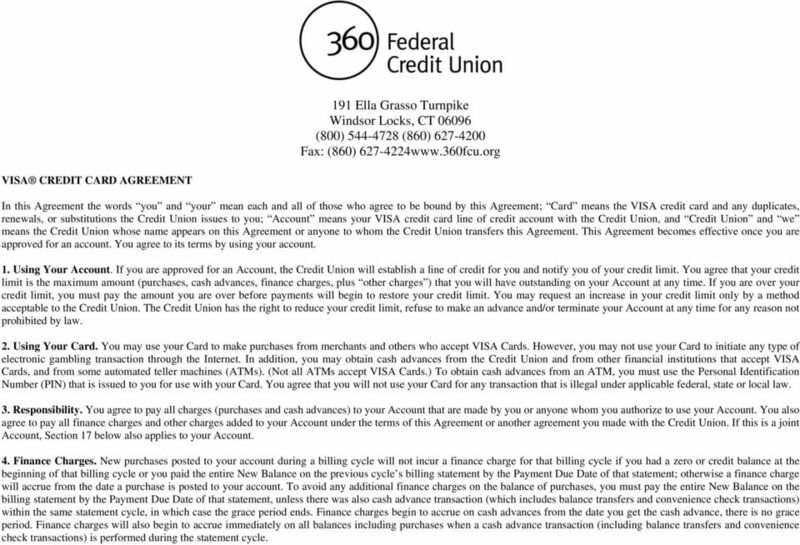 The Credit Union is subject to claims and defenses (other than tort claims) arising out of goods or services you purchase with the Card if you have made a good faith attempt but have been unable to obtain satisfaction from the merchant or service provider, and (a) your purchase was made in response to an advertisement the Credit Union sent or participated in sending to you; or (b) your purchase cost more than $50 and was made in your state or within one hundred (100) miles of your home. 17. Joint Accounts. If this is a joint Account, each person on the Account agrees to the terms of this Agreement by using the account. Each of you will be individually and jointly responsible for paying all amounts owed under this Agreement. This means that the Credit Union can require any one of you individually to repay the entire amount owed under this Agreement. Each of you authorizes the other(s) to make purchases or cash advances individually. Any one of you may terminate the Account and the termination will be effective as to all of you. 18. Effect of Agreement. This Agreement is the contract which applies to all transactions on your Account even though the sales, cash advances, credit or other slips you sign or receive may contain different terms. 19. No Waiver. The Credit Union can delay enforcing any of its rights any number of times without losing them. 20. Statements and Notices. Statements and notices will be mailed to you at the most recent address you have given the Credit Union. Notice sent to any one of you will be considered notice to all. 21. Final Expression. 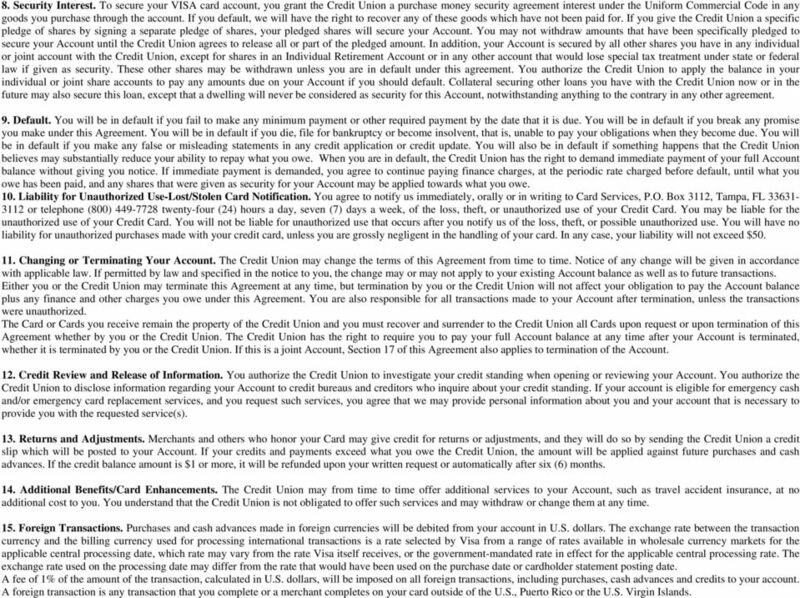 This Agreement is the final expression of the terms and conditions of this VISA line of credit between you and the Credit Union. This written Agreement may not be contradicted by evidence of any alleged oral agreement. 22. Signatures. You authorize the use of electronic signatures, facsimile signatures and photocopied signatures. For all purposes said signatures to have the same force an effect as original signatures for all transactions included in applications or agreements with us. 23. Acknowledgments. If we go to court for any reason, you agree and understand that we can use a copy, filmed or electronic of any periodic statement, this agreement or any facsimile signature to prove what you owe us or that a transaction has taken place. Such copies shall have the same validity as the original. VISA CLASSIC/VISA SECURED/VISA PLATINUM CONSUMER CREDIT CARD AGREEMENT In this Agreement, Agreement means this Consumer Credit Card Agreement. Disclosure means the Credit Card Account Opening Disclosure. Check below to indicate the type of credit for which you are applying. Married Applicants may apply for a separate account. VISA PLATINUM/VISA GOLD/VISA CLASSIC CONSUMER CREDIT CARD AGREEMENT In this Agreement, Agreement means this Consumer Credit Card Agreement. Disclosure means the Credit Card Account Opening Disclosure. None None 1.00% of each multiple currency transaction in U.S. dollars 0.80% of each single currency transaction in U.S.
3.99% Introductory APR for a period of 12 billing cycles. $25.00 or the amount of the required minimum payment, whichever is less, if you are ten (10) or more days late in making a payment. 0.80% of each single currency transaction in U.S. dollars. $25.00 or the amount of the required minimum payment, whichever is less. $25.00 or the amount of the transaction exceeding your credit limit, whichever is less. BUSINESS CREDIT CARD ADDENDUM This addendum is incorporated into and becomes part of your LOANLINER Business Credit Card Agreement. Please keep this attached to your LOANLINER Business Credit Card Agreement. VISA PLATINUM WITH REWARDS/VISA PLATINUM/VISA PLATINUM SECURED WITH REWARDS/VISA PLATINUM SECURED CONSUMER CREDIT CARD AGREEMENT In this Agreement, Agreement means this Consumer Credit Card Agreement. VISA PLATINUM AND VISA PLATINUM REWARDS CONSUMER CREDIT CARD AGREEMENT In this Agreement, Agreement means this Consumer Credit Card Agreement. Disclosure means the Credit Card Account Opening Disclosure. Individual Credit One VISA-ATM card will be issued in your name only. A personal identification number (PIN) will be issued. STANDARD MASTERCARD AND PLATINUM MASTERCARD CONSUMER CREDIT CARD AGREEMENT In this Agreement, Agreement means this Consumer Credit Card Agreement. Disclosure means the Credit Card Account Opening Disclosure. F1 APPLICATION AND SOLICITATION DISCLOSURE. Interest Rates and Interest Charges Annual Percentage Rate (APR) for Purchases. the Prime Rate. GOLD MASTERCARD AND STANDARD MASTERCARD CONSUMER CREDIT CARD AGREEMENT In this Agreement, Agreement means this Consumer Credit Card Agreement. Disclosure means the Credit Card Account Opening Disclosure. ISPFCU VISA PLATINUM PROGRAMS TERMS AND CONDITIONS The information about the costs of the card described is accurate as of November 2, 2012. Share Secured Visa Credit Card Agreement. 10.99% when you open your accounts, based on your credit worthiness. VISA Platinum and Visa Platinum Rewards Credit Card Agreement In this Agreement the words you and your mean each and all of those who sign the application or use the credit card(s) or convenience check(s). Travis County Credit Union MasterCard Credit Card Agreement & Truth in Lending Disclosure Please retain for personal records This is your MasterCard Credit Card Agreement and Truth-In-Lending disclosure. Interest Rates and Interest Charges. 9.9% This APR may change based upon your creditworthiness. Visa Platinum Rewards Credit Card Account Opening Disclosure Interest Rates and Interest Charges For Purchases, and Cash Advances For Balance Transfers 9.9% This APR may change based upon your creditworthiness. 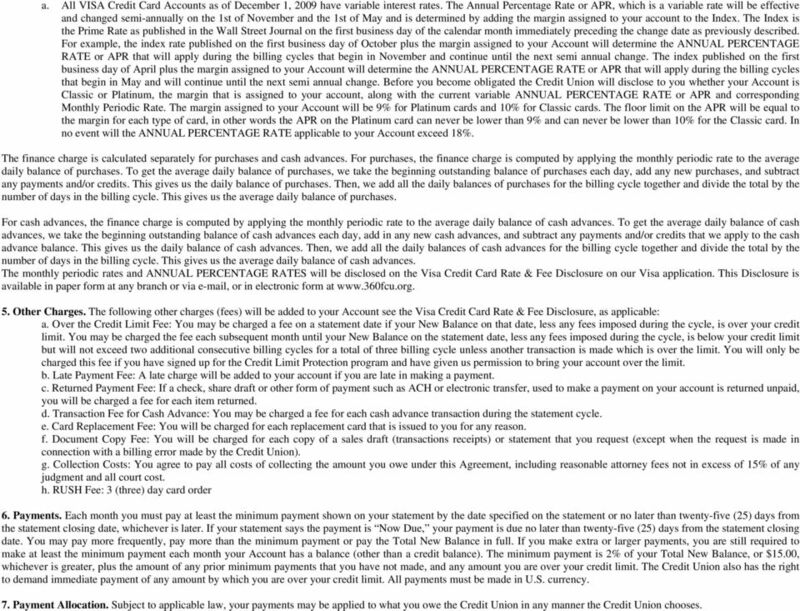 CREDIT CARD DISCLOSURE STATEMENT AND AGREEMENT FOR APGFCU CREDIT AND SHARE SECURED CREDIT In this Agreement the words you and your mean each and all of those who apply for the card or who sign this Agreement. 9.18% $0 $0 Up to 1% of each transaction in U.S. dollars.